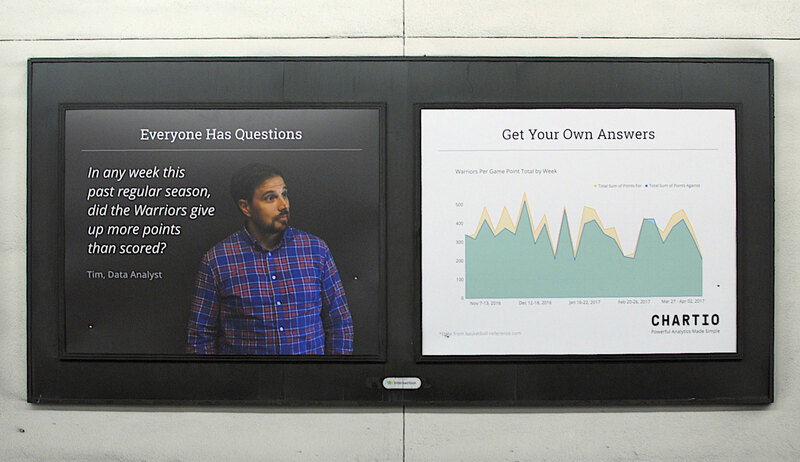 After doing a healthy bit of research, the Marketing team at Chartio decided they wanted metro advertisements. Through some cunning negotions, they secured an entire floor of a downtown station (Montgomery Street BART in San Francisco) for a month (September of 2017). They also needed me to turn over finished files within a week. To be clear, this meant 52 ad panels (26 pairs), ready to print and put up on both sides of the platform, in 7 days. For the first point, I needed to make sure the ads looked like something a potential Chartio customer or employee would care about. 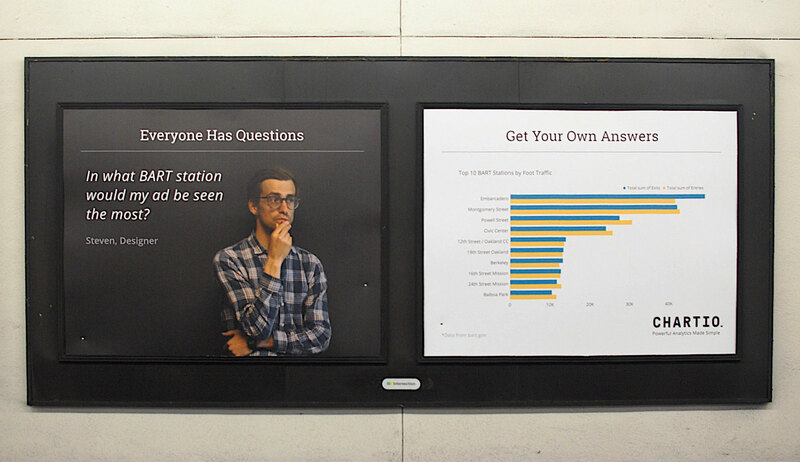 I also wanted to consider many people using this station would be going to work, and would see these ads every day waiting for the train. I didn’t want some bad joke that would get worse and worse with every day on the wall. For the next two points, I looked to Chartio’s mission statement, which is “JOIN people ON data”. This is a SQL pun refferencing data table joins, and quickly sums up how the company aims to connect people with the data they need. I felt if I could infuse this phrase into the ads somehow, I’d be on the right track. One of my first ideas was to take full advantage of the fact we had all the ads in the station, a propper “takeover”. I thought it would be clever to have a really long, smooth area or line chart, with occasional spikes, spanning all the ads. The flat, “boring” areas of the chart would span several ads and have no text (and I hoped would make people curious). An early idea with one, long chart spanning the entire platform. The messaging would appear next to the spikes in the chart. It would focus on how collecting a bunch of data about your company is more helpful if you’re visualizing it and can notice when big things happen. It was interesting, but I was basically trying to invent a new message to fit my cool visual. So, that was no bueno. I liked the idea of pairing questions with answers. I quickly made another doodle with a person on the left side asking a question, and on the right side? We would build charts with our chart builder of course. After pitching my idea to the team, it was approved by our team lead and CEO. Getting good quality photos of people for the ads was a little tougher with the time constraints though. We initially wanted to get customers to pose for photos, but we just didn’t have the time to coordinate something like that. Luckily, the team had my back. 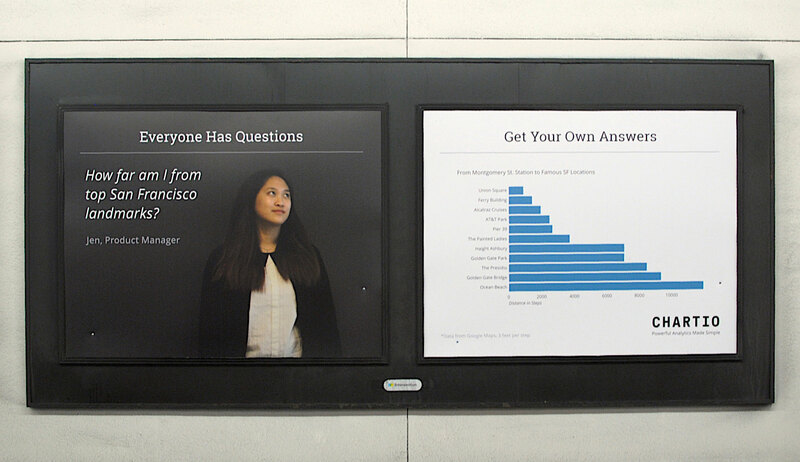 People volunteered to stand in front of a wall while I photographed them, another person took photos of me in front of the wall, and other people helped me think of good questions people in an SF subway station might be asking. Then, even more people helped me collect data to answer those questions and ultimately build charts with said data. If you didn’t read any of the words, you still saw a black box joing people and data (oh, hey). But if you happened to take the train every day and stood in front of these signs a lot, there were real charts you could read showing things like distance to SF landmarks or stats on the Golden State Warriors during the past season. 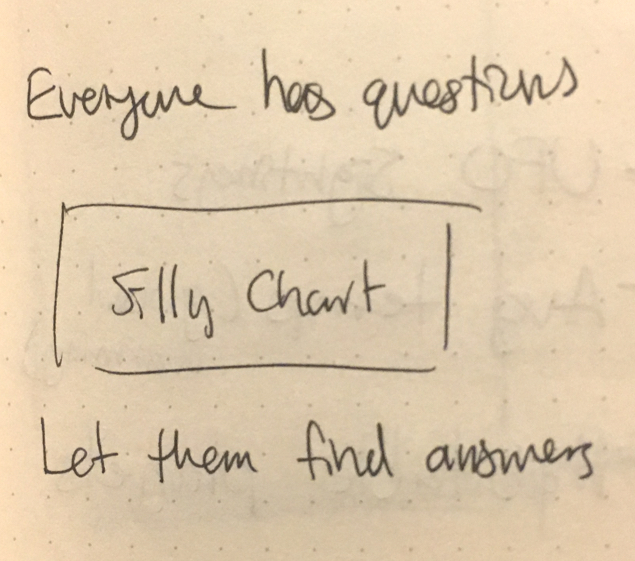 Every fifth or sixth gropuing contained and ad pair with a larger Chartio logo and the phrase “Now Everyone (Not Just the Data Team) Can Explore Their Data”. 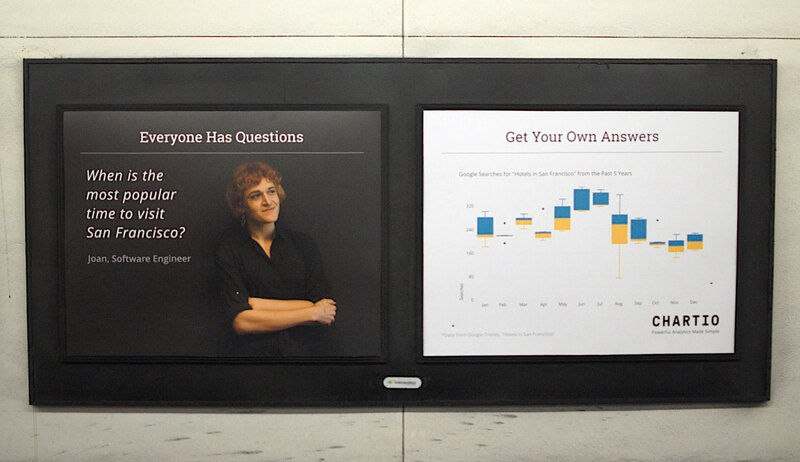 These panels also had all the portraits from the other ads running across their lower halves, driving home how Chartio connects every department to data.